You don’t see many arcade racers nowadays. MotorStorm and Burnout were once some of the most acclaimed out there, but it’s been a while since we’ve had a fresh, unique and original take on the racing genre. However, the former Evolution Studios development team who created MotorStorm and DRIVECLUB were shuttered by Sony in 2016 before joining forces with Codemasters later that year to begin work on a brand-new original racing IP. 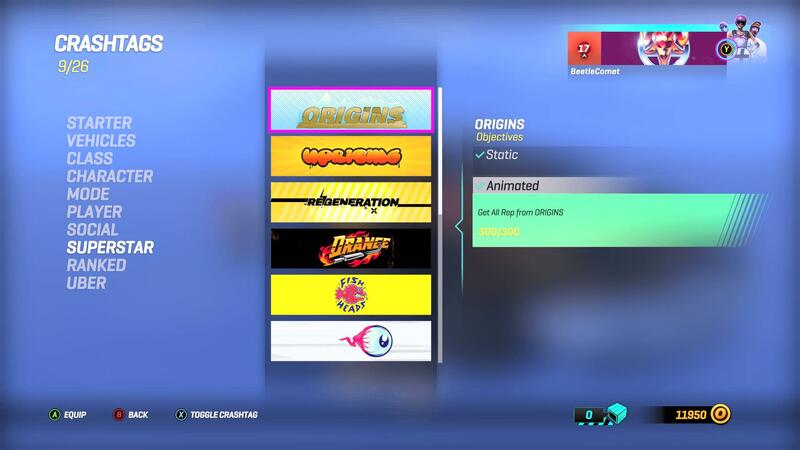 The result of that consolidation is ONRUSH – a stylish, frantic and unique arcade racer that allows players to experiment with different approaches to how they play and discover the possibilities for teamplay with endless tactical depth that underpins all the game’s fast-paced action. ONRUSH is a racing game that’s meant to be played together, be it with friends or against rivals. It’s also inclusive so players of all skills levels can enjoy playing together. Because ONRUSH always thrusts you into the action with its unique and innovative ‘Stampede’ system, it allows everyone to feel competitive when playing. ONRUSH is a new form of motorsport that's all about freedom, creativity and chaos. The Stampede has resulted in ONRUSH breaking the typical racing tradition in favour of something that’s more accessible, fun and action-driven. Codemasters Evo, as the team is officially called, were inspired by classic arcade racers, modern shooters and team sports mechanics when creating this system and it has led to the game’s focus on unique objective-based modes that offer depth through evolving gameplay and teamwork. That means there’s no race to finish in first place, there’s not even a lap-counter. Instead, ONRUSH is all about cooperating with your teammates to meet the objective, smash out your opponents, and most of all, to have fun in the process. ONRUSH features a short tutorial that players are required to complete before progressing with the game. It does a good job of introducing you to everything related to the arcade racer without dragging on, including the basic driving mechanics and boost, the importance of working with your teammates and taking down opponents, as well as smashing into ‘Fodder,’ which are smaller, bite-sized AI-controlled vehicles that provide an immediate burst of boost when crashed into. Fodder are neutral AI-controlled vehicles, reminiscent of the AI characters from Titanfall. The tutorial also features an amusing voiceover, who uses some great lines when guiding you throughout the game. She also explains the overall mechanics and concepts used in ONRUSH without pausing or interrupting the action – it leaves a great first impression for Codemasters new racer as you begin to get to grips with the vehicle handling, boost and of course, RUSH, which is the last thing you’ll be introduced to in the short 2-minute tutorial. It’s a cool way to end it, and you’ll have unlocked four Achievements from just completing it, too! Nice. 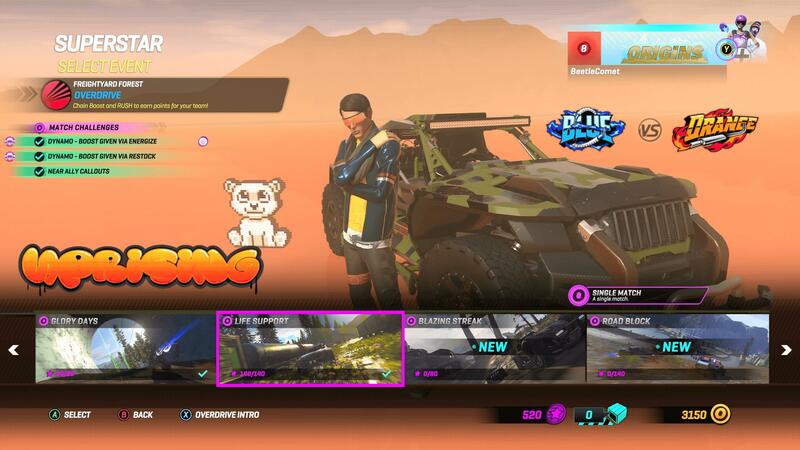 With the introductions out the way, you’ll be thrusted straight onto the main menu where you can access everything ONRUSH has to offer – whether you want to play, customize your vehicle, or personalize your character. There’s plenty of shells, outfits, bike tricks and post-game celebratory emotes which can be unlocked as you play ONRUSH, and these are rewarded to you via Gear Crates, which are exclusively earned by completing events, challenges and levelling up. Amusingly, these crates look like Wall-E and they even have a face on them! If you unlock something you like in a Gear Crate, such as a rare outfit or vehicle shell, it can be immediately equipped. There’s also no form of microtransactions in ONRUSH at all, at least not at launch. 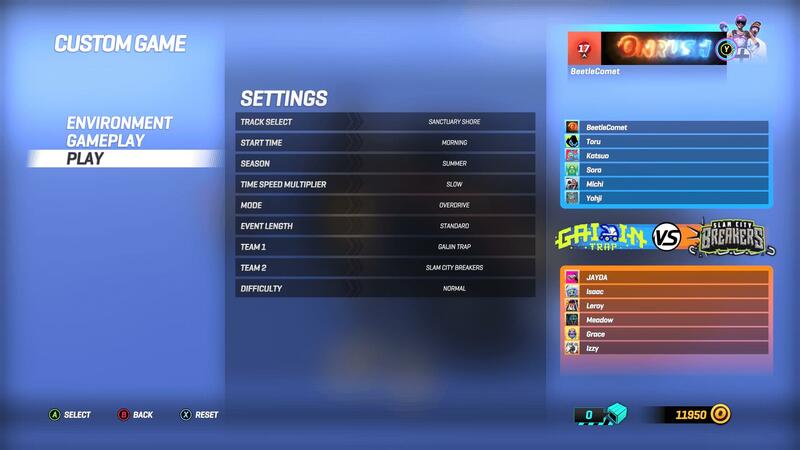 The ONRUSH main menu is a clean and simple affair where you can either play or customize. Whilst ONRUSH has been built to be an online experience first and foremost, there is a full campaign mode that offers nearly 100 events – all of which can be enjoyed with up to 5 friends in co-op. The ‘Superstar’ campaign is broken down into multiple series and events, each of which introduce you to the different modes, vehicles, abilities, maps and conditions in the game. Throughout different events, you’ll earn medallion stars that’ll unlock each of the game’s six different chapters. 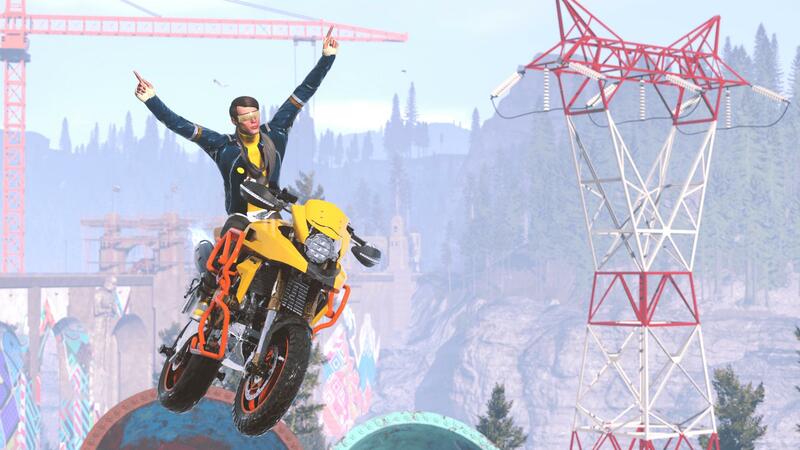 Bonus medals are also rewarded for completing optional challenges, such as pulling off mid-air stunts on a bike without a crash landing or taking advantage of the RUSH ability. You can also go back later to redo these optional challenges to attain 100% completion in the Superstar campaign. There’s also some backstory to all this as well. The whole concept of ONRUSH began with thrill-seekers who desired more from racing, and thus, they kicked down the rules that restrict and confine motorsport. There’s no race to the finish line in ONRUSH. It’s all about being amidst that high-speed Stampede. Players aren’t penalized for contact or bypassing track violations. In fact, this is the type of behaviour encouraged in ONRUSH. The result? The most unique arcade racer in years. In a way, it feels wrong to describe ONRUSH as “a racing game,” because this is something entirely different. ONRUSH is a genre in itself. It’s not about the outcome of the events, it’s how you get there. The Superstar campaign is an excellent single-player experience full of unlockables. The Superstar campaign mode sees you competing against mutual thrill-seekers who are all after that ‘ONRUSH Founders’ Trophy.’ It’s extensive and fun, despite the game’s online focus. It shows the overall attention-to-detail across all aspects of ONRUSH and it has become one of my favourite ways to enjoy the game. In fact, the Superstar campaign is the best training ground for online with its competitive AI that’s fun, challenging and balanced – pushing you to the limit as you advance to more difficult events. Wins and takedowns still feel rewarding in the Superstar campaign, just like in online play. There’s also tournaments that chain multiple events and challenges together, which are addictive, competitive and fun. ONRUSH has a level of attention-to-detail that makes it unlike many other titles and it shows from the lush track environments and addictive game modes to the robust vehicle models. Another aspect that stood-out and impressed me was the improvements Codemasters Evo has made since the beta last month. Well, firstly, the beta only was a small taster of the ONRUSH experience and didn’t do the game justice. It had two maps, two modes, and four vehicles in comparison to the full game’s whopping twelve maps with dynamic time and weather conditions, four unique modes, and eight customizable vehicle classes – all enjoyable in either online play or the Superstar campaign. I was impressed by the ONRUSH Beta, but the full game feels like a significant step-up. Secondly, the Codemasters Evo team has made several improvements to the core gameplay since the beta, too. Tweaks to improve the Photo Mode have been made, the overall vehicle handling feels more refined, the textures on Xbox One X appear to be more crisp and vibrant, whilst the AI now feels more balanced and competitive. Knowing that the Codemasters Evo team tinkered around with ONRUSH and polished these areas before shipping the final product shows how committed this team truly is. Considering the issues that can often plague some games at launch, I’m impressed by how refined and completed ONRUSH feels. The Photo Mode experience in ONRUSH is also one of the best I’ve used in a game to-date. It doesn’t offer the most number of options or configurability as seen in other Photo Modes, but it does most of the heavy-lifting for the player to result in some incredible shots. In fact, because there’s always carnage and mayhem in ONRUSH, it means there’s always a perfect photo opportunity. I can guarantee you that every time you open Photo Mode, you’ll be able to snap one wicked shot. ONRUSH is so dynamic and surprising, there’s always something new to capture. Plus, the slow-motion takedowns in offline play look awesome and result in some unmissable photo opportunities! As a self-obsessed game photographer, the Photo Mode in ONRUSH has me immensely pleased. Capturing ONRUSH is also incredible because of how much colour there is. This game oozes HDR, literally. With Photo Mode allowing you to use different filters that suit you style, you can take some really colourful shots, as well as close-ups of vehicles thanks to their high-polygonal count and detailed frames, interiors and paint jobs. It’s quite absurd how much detail has been applied to the vehicles in ONRUSH, but they look incredible. The same can be said for all the assets deployed in ONRUSH, too. There’s a lot of details on show in this game, so it’s no surprise that Codemasters Evo used photogrammetry to build up its track locations. The environments feel alive, varied and individually unique from each other, and were captured using drone data of real-world locations to create those realistic models and tracks. Be it rocks, forestry, canyons, dams or beaches, ONRUSH shows true attention to detail across the board. In fact, the foliage is some of the most highly-detailed and realistic I’ve seen in a game yet. It’s also fun to use Photo Mode to truly explore how thoroughly-detailed and expansive each track environment looks, which makes the overall visual spectacle in live gameplay feel so immersive. The level of detail in these track enviornments is almost absurd! Just look at that foliage! In addition, the campaign mode is broken down into seasons to increase its overall variety and make the tracks feel even more alive. Flowers and trees will bloom in Spring and Summer, change colour in Autumn and fade in Winter. All four seasons have been authentically brought to life in ONRUSH with a full day and night cycle and true dynamic weather. The sun’s position also changes throughout races based on the time-of-day and season. It’s all quite fantastic. These visual features combined with ONRUSH’s unique art-style result in something that’s absolutely spectacular. 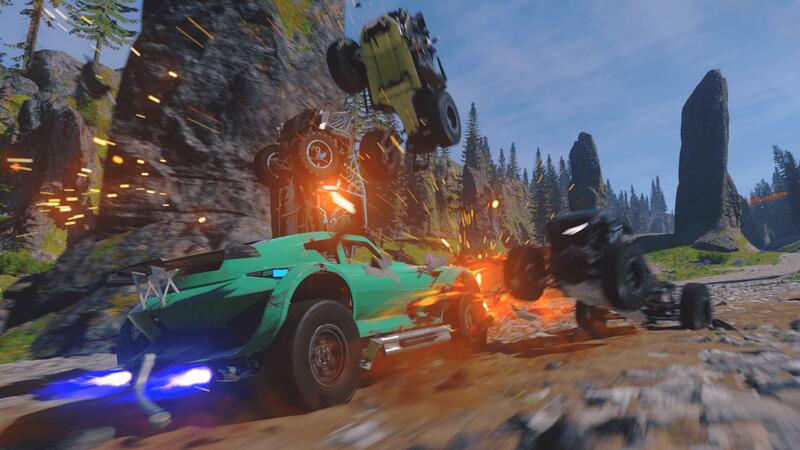 ONRUSH features a total of 12 unique, diverse track locations that offer tons of replayability when fused with the dynamic conditions found in the game. They also have multiple routes, stunts and jumps to provide the player with various ways to tackle them as they take down their opponents. Snow accumulates on the track and covers rocky terrain as detailed rain droplets create puddles across the environment. The lighting is also robust, it looks stunning and shines brightly in HDR with vivid colours and a stunning atmospheric effect. There’s also thunder and lightning that flares up the sky, whilst snowstorms and other dynamic weather effects are made dramatic by the game’s volumetric cloud system to result in some awe-inspiring scenes. It’s amazing. Procedural damage can also be seen on vehicles, as well as snow and dirt accumulation. The wheels even create tire marks in the snow and dirt, too. The Stampede combined with the visual brilliance of ONRUSH is an experience like no other. These visual features aren’t something you’d expect from a game like ONRUSH, but when you consider that this comes from the talented team behind DRIVECLUB and MotorStorm, it makes sense. This same level of attention-to-detail is also applied to the audio in ONRUSH. Detailed sound effects are combined with an incredible musical style. The upbeat, licensed extreme sports soundtrack is one of the best I’ve heard yet in a game and combined with the constant action of ONRUSH, there isn’t a dull moment. It’s a positive soundtrack that keeps you involved in the action. It’s also dynamic as the music changes when you wreck, respawn into the action, utilize your RUSH ability, or simply get epic air-time. It makes the audio experience feel fresh, vivid and interactive. ONRUSH also eliminates the wait most racing games make you endure by cutting down on loading times and offering seamless drop-in and drop-out for co-op with friends and in online matches. The loading screens that are present do appear quite plain, but that’s understandable when you consider how the game loads in the vehicles and track assets for each player. It does so with the aim of quick transitions, so it can quickly rush you into the action. It works, as loading really doesn’t feel long at all. The online matchmaking also runs on dedicated servers, and it’s shown by how ridiculously fast the Quick Play mode thrusts you into an online match. You literally click on it and the pre-match countdown has already begun! Madness, but in the best kind of way. Another neat aspect of ONRUSH is its Custom Game experience. From here, you can tailor the track, mode and difficulty to be exactly how you want. You can set the season and choose the time of the day, select your game mode, and invite your friends to join you in the action. You can also adjust the difficult of AI opponents to make it as easy or as challenging as you desire, customize the event length, change teams and even speed up time to progress much quicker than usual. Obviously, the choice of vehicle class is all yours, so choose wisely. I love the freedom offered in Custom Game since I can curate the ONRUSH experience to be how I want it to be, but I do wish there was more configuration of the weather scenario beyond the season select option – which relies on probability based on the time of year. Customization in Custom Game is fantastic, but I wish weather effects were configurable. Meanwhile, each of the vehicle classes and game modes in ONRUSH are introduced by a short video that outlines their main abilities and core objectives. These short bite-sized videos allow you to become aware of the different traits on each of your vehicles and figure out the best strategies for the upcoming match. There’s even a section on the main menu for accessing helpful tips and videos. It’s another nice touch to the game that adds to its overall accessibility factor. 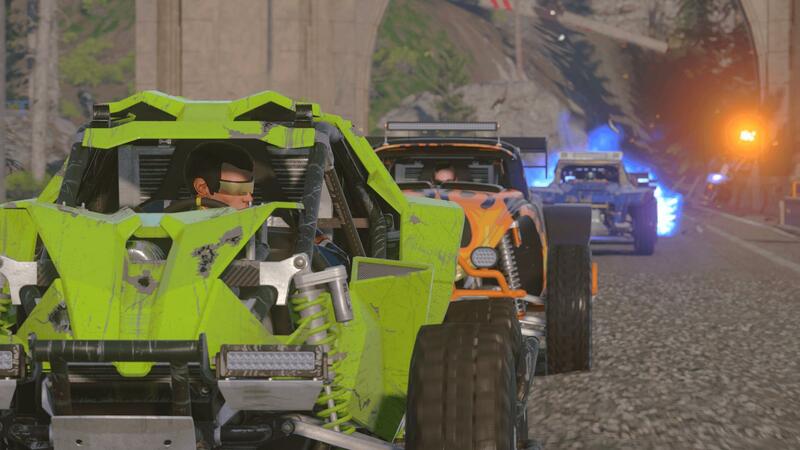 ONRUSH has been designed for gamers of all kinds and of all ages. Whether you’re young, old, competitive or casual, you’re sure to become hooked to its engrossing and seamless action-driven carnage. This is all made even better by the extremely responsive controls in ONRUSH. Latency delay is kept to a minimum, which makes each vehicle feel nimble and precise amidst all the action. 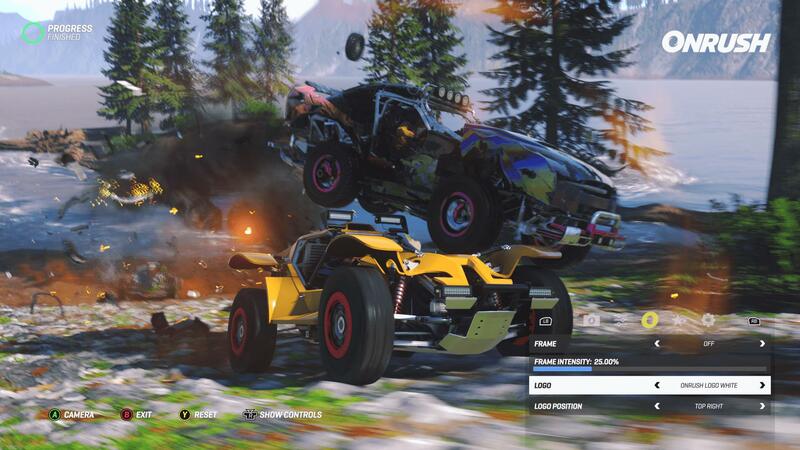 Whilst accessible, the overall vehicle handling mechanics allow for over-the-top, risky gameplay scenarios. The camera also shakes to add to the overall immersion without causing nauseous effects, whilst the change in audio and slow-motion effect makes takedowns feel satisfying. There’s also a ‘Wreckcam’ that shows a quick replay of your demise if you’re wrecked during an event, but this can sometimes make respawning feel a little lengthy. ONRUSH delivers both speed and spectacle with an unflinching framerate. To add to its high-impact adrenaline-fuelled off-road arcade gameplay, ONRUSH runs at a locked 60FPS on the Xbox One X, PS4 Pro, and even the standard PS4. In fact, users on all three of these systems can choose between two different pre-set visual modes. 60FPS will always be the default, where the game runs at native 1080p resolution on Xbox One X and PS4 Pro, and 900p on the base PS4 model. Players can choose to crank up the resolution if they wish – up to 4K on both the upgraded systems and 1080p on PS4, with the framerate capping to 30fps in this specific mode. On the base Xbox One, users are capped to 900p at 30fps – most likely due to the system’s overall weaker CPU architecture. However, the real cherry on top comes for those on Xbox One X. It’s the only console version of ONRUSH to feature textures built for 4K resolution. Whilst it can hit 4K on the PS4 Pro, the Xbox One X will have highly-detailed texture assets to go with it. This means environments are brought to life with crisp, clear details and stunning backdrops. It means Photo Mode captures look incredibly detailed, vibrant and real. It’s an excellent result, and whether you’re playing in the 60FPS or 4K resolution mode, you’ll still benefit from the native 4K textures – even in 1080p. It’s a win-win scenario for everyone on the Xbox One X, regardless of your preference, and another visual triumph for the system. The Xbox One X is the only console to feature native 4K textures for ONRUSH. The 4K textures on Xbox One X increase the overall file size of the game by around 10GB, but the result is totally worth it. Having played ONRUSH on both a standard PS4 console in 1080p and on the Xbox One X in 4K HDR, I’m honestly blown away by the level of visual fluidity on show in ONRUSH. The choice between 60FPS or 4K/1080p is also a wonderful addition and having tested both modes on the Xbox One X and PS4, I can safely assure you that they’re both of the high-quality standard shown across the rest of ONRUSH. The framerate is unflinching in either mode on these systems, and the visuals pumped out on both will undoubtedly immersive you even further into the high-temp thrills and the spectacular levels of fun and excitement to be had in ONRUSH. Like the choice between the two visual modes, the different vehicle classes in ONRUSH are all worth trying out as you rise your way through the Superstar campaign and make a name for yourself in online play. 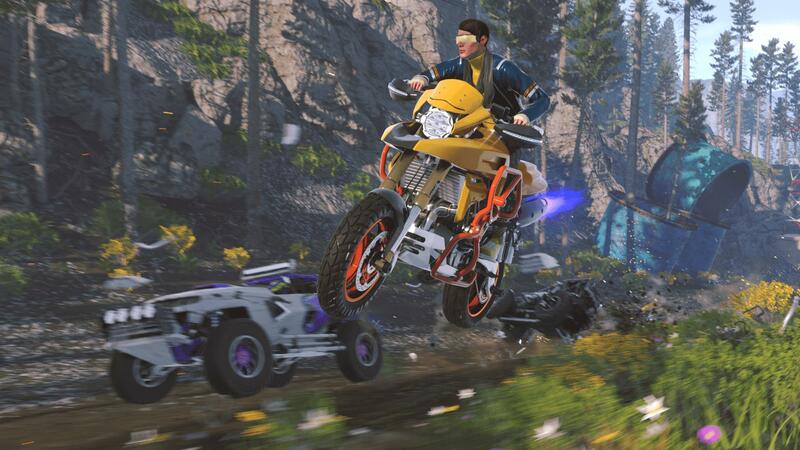 As mentioned, the single-player experience will introduce you to the distinct line-up of vehicle contenders in ONRUSH, and these include the Blade, Outlaw, Vortex, Charger, Interceptor, Dynamo, Titan and Enforcer, each bringing their own handling style, abilities and characteristics – including their very own unique flavour of RUSH. RUSH is a key aspect when it comes to choosing your vehicle class ahead of a match. It’s made to be the ultimate manifestation of speed and strength – an intense and unstoppable power that delivers your best thrills and takedowns. Some of my most memorable moments in ONRUSH have come from RUSH. It’s like a huge shot of adrenaline to your game – an incredibly powerful effect that leaves your opponents weeping! Whether you’re on a rampage to rack up takedowns or your simply want to protect more vulnerable team-mates, RUSH is a hit you’ll always crave in this game. Thankfully, it’s easy to obtain as your RUSH metre fills up by simply using boost! ONRUSH is centered around that huge shot of adrenaline boost referred to as RUSH. There’s nothing quite like getting big air on the Blade motorcycle before smashing right down on an opponent with your RUSH boost. It feels ridiculously good – and no, I don’t feel any remorse when it happens either! Not only does each vehicle class have a different flavour of RUSH, but they also have unique abilities and traits. I love how the Charger gains RUSH by driving near enemies, whilst the Enforcer can temporarily disable the boost by hitting opponents and can even earn RUSH from taking down Fodder! The Dynamo also has a neat ability by dropping boost pick-ups for your team whenever you use boost, and it can also earn RUSH directly from driving near teammates. The abilities and traits range from playing competitively to being cooperative with your teammates – it’s a perfect balance. The RUSH abilities also differ based on the vehicle class. The Blade’s unique Firewall effect leaves a destructive trail of scorching fire behind it – instantly eliminating any opponent who falls in its path. The Outlaw will drain boost from opponents in range, whilst the Charger can literally plow through any opponent in its way. The Enforcer’s RUSH effect blinds opponents who are falling behind the Stampede, whilst the Interceptor can refill its RUSH gauge with every successful takedown. These unique approaches to RUSH are combined by its overall benefit – and that’s a short burst of fiery power that allows you to wreak havoc on your opponents and take control of the objective. Just remember that everyone also has their own RUSH ability, too. Each class in ONRUSH is so unique and different, it makes them all fresh and exciting to use. Overall, the Blade, Vortex, Dynamo and Enforcer are becoming my go-to vehicles in ONRUSH, but it’s important to not always stick to the same type of vehicle class. 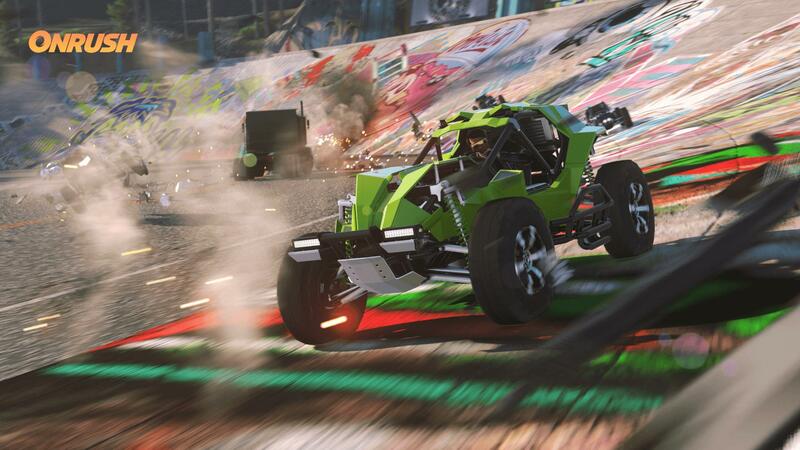 You might have one or two that you’re always dominant in but learning the strengths and weaknesses of each vehicle can go a long way to being fluent with all-things related to ONRUSH. Switch it up and take advantage of the different abilities and traits that each vehicle class enables. Whenever you’re taken out by an opponent – or oftentimes in my case, by slamming into a tree trunk or wall, you can change your vehicle class for when you respawn if you fancy something a little different. This ensures the experience remains fresh, dynamic and addictive, and allows you to use either the class you fancy playing or the one you think that’ll be most beneficial to your team. 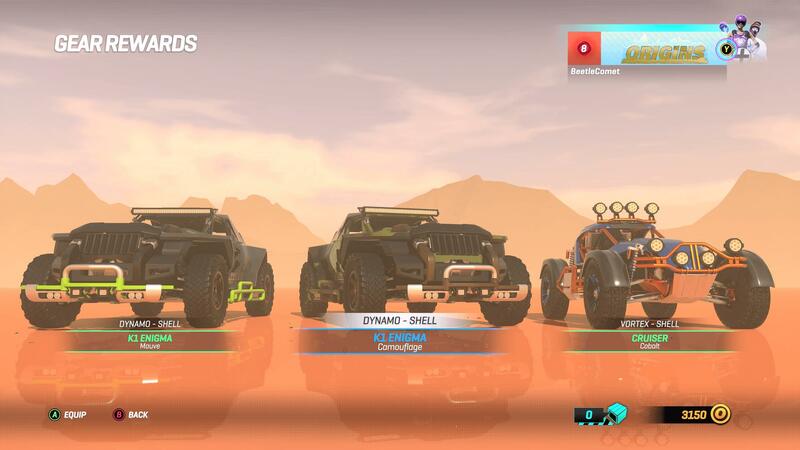 ONRUSH will also show which vehicles your teammates have selected, both pre-match in the lobby screen and during events. On a slightly different note, it can also be somewhat irritating when you accidently wreck yourself out repeatedly. It happens. One of my best Gear Crates from ONRUSH which included three vehicle shells. 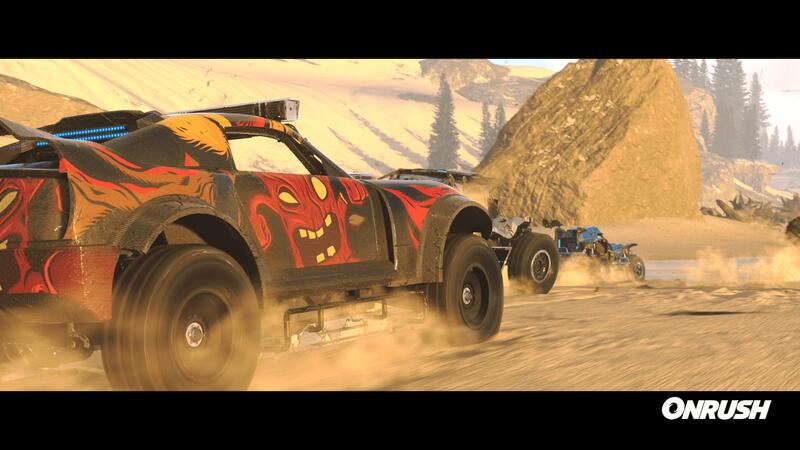 Vehicles in ONRUSH are also customizable with unique shells that can not only change the look of their paintjob, but also their bodywork. 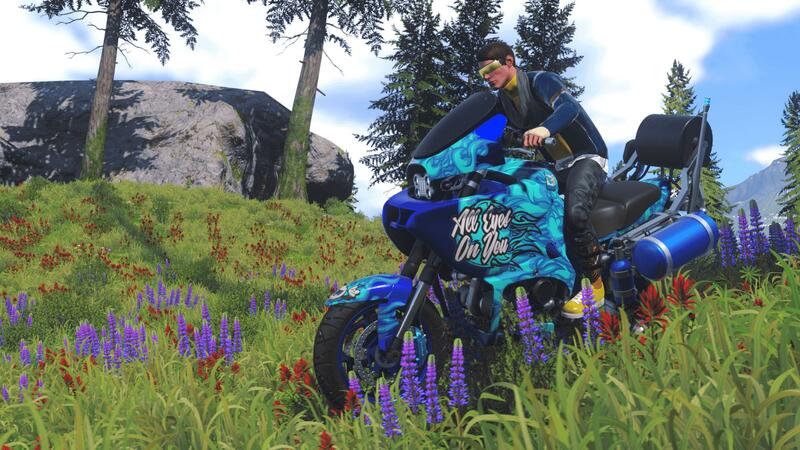 These aren’t just aesthetic designs, and those who enjoy ONRUSH the most – or get lucky in a Gear Crate, will have some of the best, rarest vehicle shells in the game. There’s no individual performance upgrades or custom tuning, nor are there benefits that make your vehicle any faster or better. It’s all purely cosmetic, and this is fantastic because it keeps things fair amongst all players, and at the end of the day, it isn’t a race to the finish line. You can also purchase select vehicle shells, character outfits, bike tricks and celebratory emotes using your in-game credits accumulated from matches. There’s also a special vendor that offers rare items on discount for a limited time. Like the vehicles classes, I’ve found myself switching between different shells and outfits as I unlock them. It’s a nice touch to the overall progression in ONRUSH and it makes me eager to keep playing to see what I’ll unlock next. With a total of 12 different characters offering multiple outfits, not to mention the variety of different vehicle shells, there’s plenty of customization options. None of it is malicious either, and there isn’t any feel of it being a grind. Just pure straight up fun as you work towards unlocking everything. Here's the Crashtag player-profile cards available to unlock in the Superstar campaign. There’s also two other areas of personalization in ONRUSH as well – Tombstones and Crashtags. If you’ve been following ONRUSH at all, then you’ll likely have heard these two words frequently and might be wondering what they are exactly. Let’s start with Tombstones, which are objects that either you or an opponent will drop whenever you wreck. Smashing through them in any game mode will grant you with a free burst of sweet boost. They also boast unique designs of various animals, emojis, country flags, objects, and more. In fact, even a member of the ONRUSH community has had their own custom-designed Tombstone featured in ONRUSH after winning a recent competition! 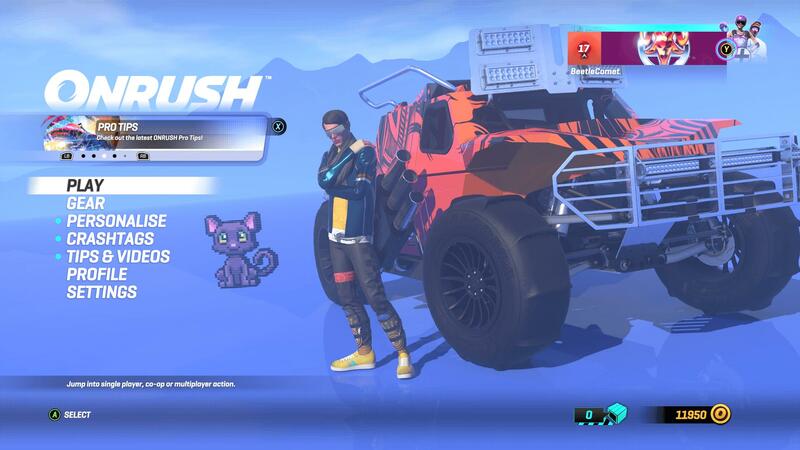 Crashtags are animated player-profile cards that display various symbols, logos and designs inspired by different aspects of ONRUSH, such as vehicles, characters and campaign levels. They also feature your Gamertag and ONRUSH Rank. These expand back into the early days of Call of Duty and have popped up across several franchises ever since. However, if you wish to unlock these Crashtags, you’ll need to perform certain tasks within the game. When you first unlock a Crashtag, an additional challenge will need to be completed if you wish to have it animated. There’s plenty to choose from and lots to unlock, but many of them will also come through natural progression! 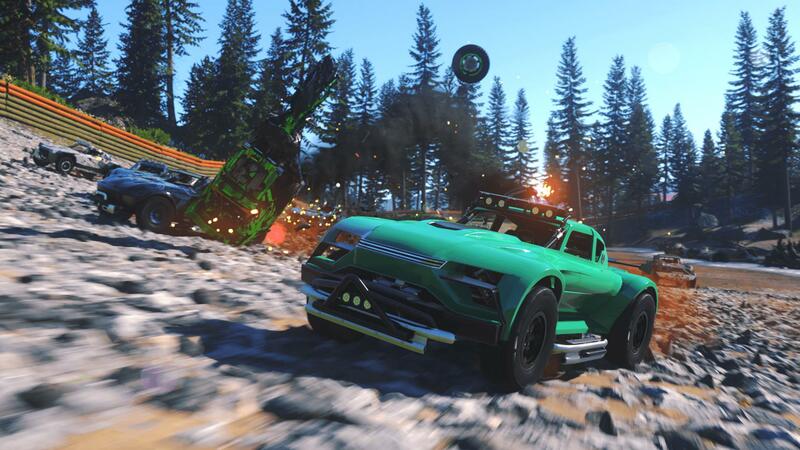 ONRUSH’s unique blend of action-driving and sensational fun is showcased across its four unique game modes, which are deployed in both the single-player and online multiplayer. 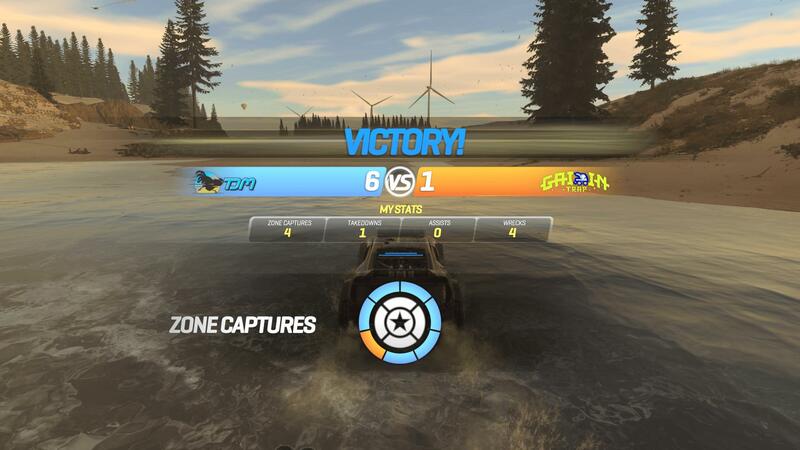 Overdrive is a pure ‘boost to win’ onslaught and delivers ONRUSH in its purest form. This mode will most likely be your first taste of the speed and spectacle to be had in Codemasters’ unique racer as you chain boost for the biggest impact and bonuses to lead your team to victory. 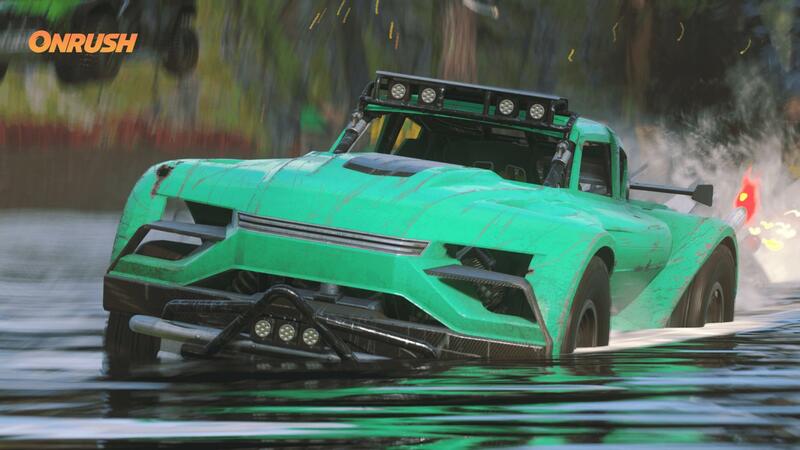 ONRUSH doesn't feature a tradtional racing mode, nor does it need one. Countdown is a race through checkpoint-styled gates against a decreasing clock. This exhilarating mode has become one of my personal favourites in ONRUSH due to its unpredictability. Hitting gates adds precious seconds to your team’s ever-decreasing time to keep you and your allies in the game. The timer for both teams is separate, and the first to have theirs reach zero will see a round victory for their opponents. Sometimes, the timer between both teams can be so close, it’s neck-and-neck action as each team tries to secure as much time as possible by driving through checkpoints. It’s also fun to take down opponents too, as this will cost them a few seconds of time as they wait to respawn. 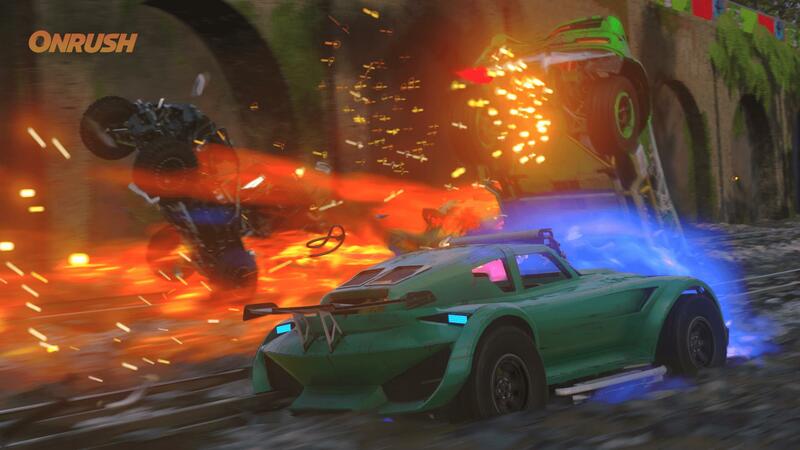 Lockdown is essentially King of the Hill, but ONRUSH-style. It’s a fight to control a moving zone as you and your team attempt to capture it. You’ll need to fight for survival and take down opponents to prevent them from scoring. Every trick in the book is applicable in this mode as you get the edge on the opposition to stop them from claiming those zones. Oftentimes, being inside the zone can feel pure chaotic as everyone fights for their place to capture it for their team. Lockdown is also one of the more fast-paced modes in ONRUSH as the winning team is the first to claim enough zones, so using your abilities wisely here is key. Victory! The post-event stats screen is a great recap for how you did in the match. The final mode in ONRUSH is Switch, and as the name says, this one will see you using increasingly stronger vehicles as you attempt to survive for as long as possible. It’s like a fast, destructive version of ‘Cat and Mouse,’ in which both teams start off on bikes – fast, nimble but vulnerable. Each player has a total of three switches, and the first team to use up all their switches will see the victory handed to their opponents. There can be a lot of tense, close finishes in Switch and the battle to take down opponents who are still clinging onto their switches makes this one of the staple modes in the game. All four of these modes have a few things in common. None of them are a race to the finish line, there’s no lap counter and the traditional rules of motorsport have been exchanged for the freedom of sensational speed and reckless driving action. They also track your statistics and highlight them at the end of each match, including the MVP or accolades such as the most assists in Overdrive or the most time added in Countdown. 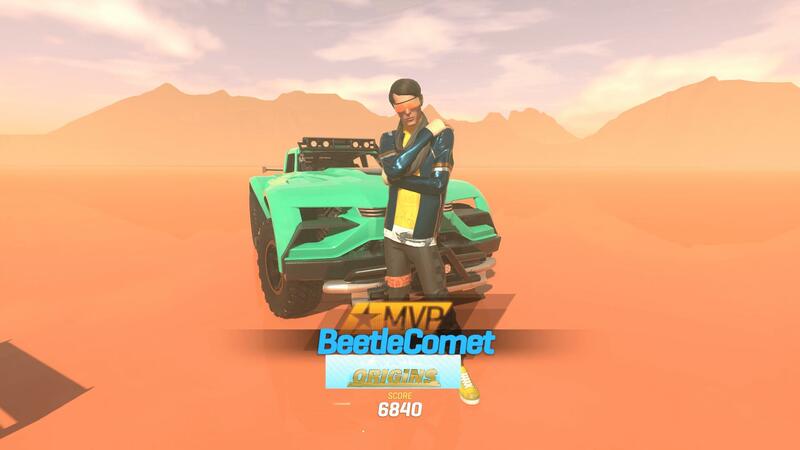 MVP means you're the best of the best at ONRUSH, especially if you earn it frequently online. Your stats and notable accomplishments are frequently highlighted in ONRUSH, and it’s another nice touch to show that winning isn’t exactly everything in this unique off-road arcade racer. There’s also an in-game chat emote system that can be used during matches. It’s as unique as it is odd, but it does allow you to praise and compliment teammates, notify them of when your RUSH gauge is refilled, and it can even be used to antagonize opponents. It’s a quick, text-based version of Game Chat that simply uses the d-pad on your controller whilst participating in events. Those who do use it might find it to be more beneficial than initially expected. Overall, the arcade genre has seen nothing quite like ONRUSH. Its fast, fun and balanced gameplay promotes accessibility, teamwork and competitive play – and because of that, it’s addictively brilliant. Looking forward, Codemasters will also introduce ranked competitive multiplayer to ONRUSH in its first major post-launch feature update for those who enjoy competing for fame and glory. Could we potentially see the rise of an esports scene with the latest Codemasters title? It’s hard to say at this point, but if anything does arise, sign me up! ONRUSH is an arcade racer like no other, and I'll certainly be spending a lot of time with it. ONRUSH has been in development for just over two years now, and the team behind the title is undeniably talented. It’s delivered some of the most fun I’ve had in a game in quite a long time – and that applies to both the single-player and online aspect, as for the first time, I genuinely feel competitive in multiplayer matches, as if I’m leading my team towards success in The Stampede. ONRUSH is undoubtedly an exception to the rule, and the result is just phenomenal. It feels like a blend of classic racers such as MotorStorm combined with modern day shooters like Overwatch and Titanfall – all fused together for the ultimate spectacle of sensational speed and over-the-top action. 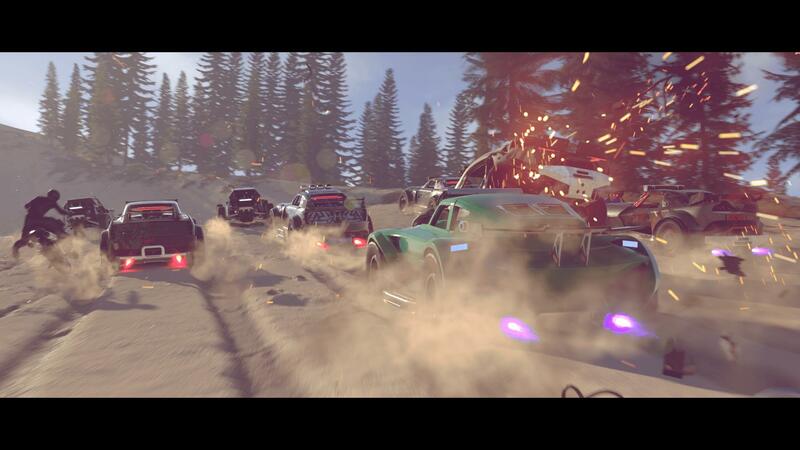 ONRUSH’s high-impact, adrenaline-fuelled off-road arcade racing delivers speed, takedowns and teamwork with high-tempo thrills to create a racer that focuses on fun, excitement and the spectacular. It’s truly something special and in a class of its own. With its innovative unique new way to play, ONRUSH has become my personal favourite new IP this generation. It’s a masterpiece and a welcomed breath of fresh air in the racing genre. ONRUSH is the result of a classic arcade racer fused with Overwatch and Titanfall. Its high-impact, adrenaline-fuelled off-roading action creates a spectacle of sensational speed, over-the-top style and pure riveting fun.